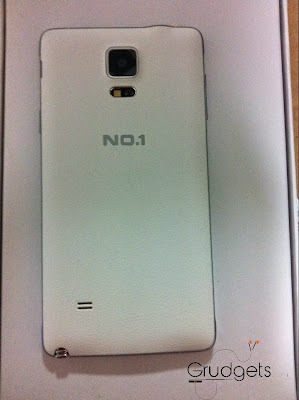 No1 Note 4 – Samsung Galaxy note 4 clone review, giveaway. 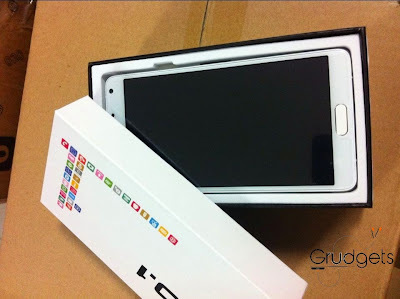 You are here: Home / Giveaway / No1 Note 4 – Best Samsung Galaxy note 4 clone review and giveaway. You won’t be able to find anything different other than what Samsung has done. 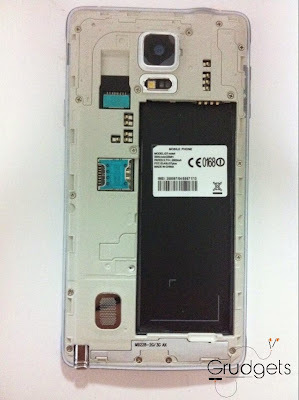 The front has two capacitive buttons on either side of the hardware key, which is typical Samsung pattern. The proximity and ambient light sensors are also placed close to the earpiece, followed by the front facing camera. The power key is present on the right hand side whilst the volume rockers on the left. At the rear, there’s main camera hooked up in the middle along with LED flash. Below that, you will find the company logo, i.e. No.1. If you are Samsung fan, you will love this device. The edges are rounded, you get an S-Pen to play with, and speaker is present on the left bottom and very minimal use of metal. 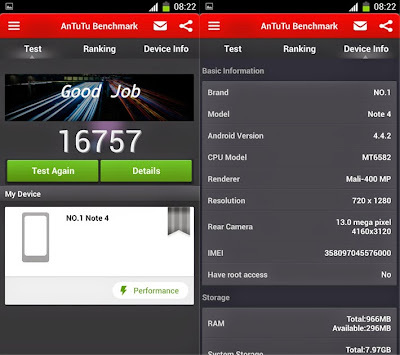 Under the hood, it packs quad core Mediatek MT6582 processor along with Mali GPU. On the software front, it uses Android KitKat v4.4.2. The UI has been revamped to make it look like the Samsung Touch Wiz and even includes Air Command feature. The S-pen proves useful for Air commands. With this device, No.1 has managed to bring large screen experience on a budget for audiences. It sports a 5.7 inches display with 1280 x 720p resolution. The pixel density is about 320 ppi, which is good enough for such an enormous displayed device. The main camera is of 13 megapixels, which is capable of recording complete HD videos. Moreover, keeping the trend of selfies in mind, they have equipped it with 5 MP front shooter. You can expect it to take great images with good quality of details. It is dual SIM device, with dual standby. You can browse internet through 2G, 3G or Wi-Fi on the go. Additional connectivity options include Bluetooth, GPS, micro USB and FM. You can even use your device for Wi-Fi tethering. 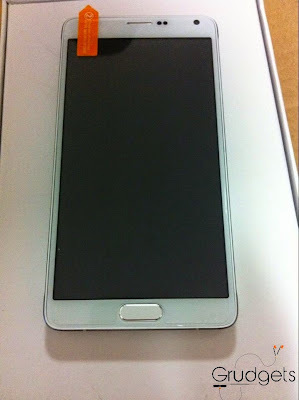 This clone of Samsung Galaxy note 4 comes along with internal memory of 8 GB alongside 1 GB RAM. Out of the internal memory, about 4.7 GB is available to the end user. On boot up, you have little over 250 MB RAM available. 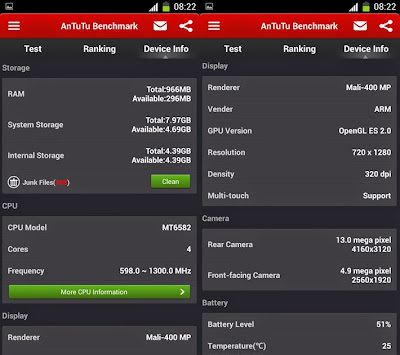 You can enjoy HD gaming on the go with these specs. The device draws juice from 2800 mah battery, which can provide standby time of up to 3 days. You can buy it online from official shop of No1 mobiles, just in case if you are too curious. The sales box includes the smartphone, battery, USB cable, screen guard, USB cable and charger. For more details about the device, refer this page on official store of No.1 mobiles. You can but it from their official shop here or through Amazon. Use coupon code “NO1-I9QCCH80” to get additional discount of $6 on their official store. The giveaway contest is being sponsored by official shop of No1 mobiles, you can have a look at their site here. They have created many good devices in the past. The winner will be receiving the device directly from No1 mobiles. Say thanks to our sponsors! This is an international giveaway, anyone from any part of the world can participate unless restricted by local laws. The winner of this contest will be announced on 20th January 2015, in New Year. 😀 So, do come back and check if you have won! Selected winner will be notified by email. In case if there is no reply from the winner within 72 hours, we will select other winner randomly through Punchtab. The device will be shipped to your place directly, since they offer international shipping. We are not responsible for warranty or any other issues related to your device. You have to perform all the steps mentioned in the widget below. You get 1 point for each action you perform. You can even earn additional points through referral entries. Anyone who enters, you will receive additional 5 points. If you are found using any false means, your entry will be discarded and other winner will be selected. Like our sponsor on Facebook. Visit our sponsor site and share it. Remember, it is necessary to do these steps, else your entry will be considered invalid. I guess you are ready to get over hood now. All the best to all participants!! Note: If the widget doesn’t load, just hit the reload button before widget or you can visit back later. If you have any questions or any query about the giveaway, you can contact us using About us page. Contests without facebook/twitter can be organized ? Only on the basis of e-mail ? Yes, you can enter through mail also. Thank you for the chance. Nice review. I did all the mandatory steps that you listed. Is there another form that I need to fill out? No, just complete the steps in the widget and you are done ! Hope to Win! Happy New Year! Can u tell me this smartphone (Samsung Galaxy note 4 clone) original or Duplicate, Can u give the phone rate? I would pee my pants if I won this! Would be a blessing to wiin this ! Nice job on Your review; very informative. Thank You for chance to win this device! What a great alternative to the Samsung Galaxy! Using this would be like using the original. Awesome! I want the note 4.. I have had each and every note up to the note 4 I am using the note 3 now and i have checked in to the 4 and cant wait to up grade I and excited about Milk and the newer front cam and the different menu set up …… By all means i would more than love to win this amazing phone..thanks for the chance! and i love note 3 but bigger and better thing are to come! Your giveaway is amazing and awesome. I would love to win one 😉 (Y) (Y) (Y) !!! Good review! I may get one of these with my next phone upgrade! Never win this before I’ve done this a lot but it was so competitive but I hope at least this time I could really get some thing. This is my 100th time doing this on a giveaway website. I’ve went to different other country website that I know the language, but never won anything really at least I want this. Man, I could use a phone. I’ve been without one for so long!